Sri Lanka Tourism says it will continue to promote the “Ramayana Trail” to attract Indian tourists, despite accusations from several local historians and archaeologists that the authorities are promoting a myth while ignoring historical inaccuracies. “It is not our job to verify historical accuracies but to encourage tourism, which is what we are doing by promoting the “Ramayana Trail”, Director General, Sri Lanka Tourism Development Authority, S. Kalaiselvam told the Sunday Times. However, a group of historians and archaeologists who gathered for a symposium titled “The Tourism Authorities Ramayana Trial” at the Royal Asiatic Society recently, said, they have investigated the so called “Ramayana Trail” and found it historically inaccurate. “We oppose the Tourist Board’s initiative in trying to promote the Ramayana Trail in the island. The information regarding the sites is historically and geographically inaccurate and such a promotion would not be favourable to the country,” one of the speakers at the seminar Dr. Susanthe Goonathilake said. The Tourism Authority has lined up a series of events for Ramayana enthusiasts, which began in June and will continue till September. 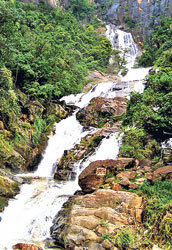 The trail will take tourists from Nuwara Eliya to Wasgamuwa, Tangalle and Chilaw, as well as many other areas on the way. “ Sri Lanka is the proud custodian of more than 50 Ramayana sites from the place of Seetha Devi's captivity to the battlefields where vast armies clashed, to the groves of exotic herbs dropped by the monkey god Hanuman, to the ultimate theatre of war where Lord Rama slew Ravana, the ten-headed demon-king,” the Tourism Authority says on its web site. Mr. Kalaiselvam said as long as people believe in the presence of historical sites in Sri Lanka, they will promote it. Dr. Goonathilake however saw a danger in promoting an Indian myth as fact. “The Indian population has nationalistic and religious impulses which could be used as a pretext for war if the sites become threatened,” he said. Another speaker Dr Malini Dias who spoke on the “Distortions of archaeological evidence”, said, that historical sites have been misinterpreted by the authorities. For example, she said, Sigiriya, which is the abode of King Kashyape is being touted as the Chitrakoota, the abode of Ravana’s brother. She added that the inscriptions on certain temples have been totally misinterpreted so as to prove the existence of Ravana’s presence. The early Brahmi cave inscription found at the Molagoda Vihara in Kandy is a clear example as the word Brahamana has been interpreted as a pilot of an aeroplane, she said. Dhanesh Wisumperuma who spoke on the “Misinterpretation of natural sciences”, said, the bridge known as Adam’s Bridge (a series of rocks that connects South India’s Rameshwaram with Sri Lanka) that was supposed to have been created by the monkey army led by Hanuman, is a natural sand bed and not a miraculous creation as stated in the Ramayana. Ruhuna Uni student: Who gave the blow of death? Who is an Executive Prime Minister?